In roughly an hour, we’ll have a look at the new phones featuring Windows Phone 7. Here’s an early look at what we can expect, pulled from the Today Show this morning that featured Microsoft’s CEO Steve Ballmer. Is that all ya got??? Not too impressive. Is that it for selection? What about Verizon, no offerings here?? There were a ton of phones announced today. These three happened to be featured before the official announcement. On AT&T, there is the Samsung Focus, HTC Surround or LG Quantum. T-Mobile brings the Samsung Omnia 7, HTC HD7 and the HTC 7 Mozart. There is also the Dell Venue Pro. 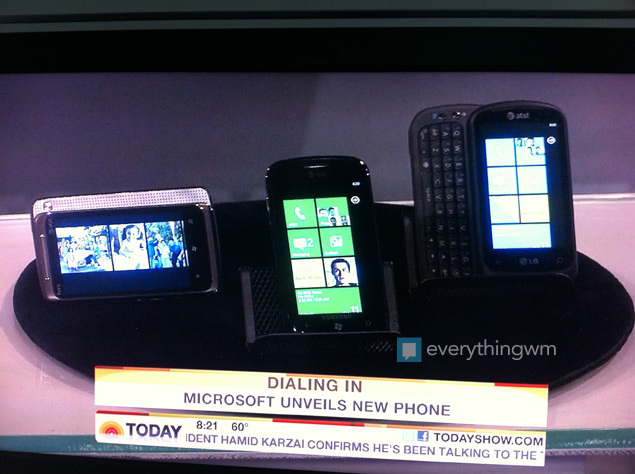 So plenty of new Windows Phone 7 phones.